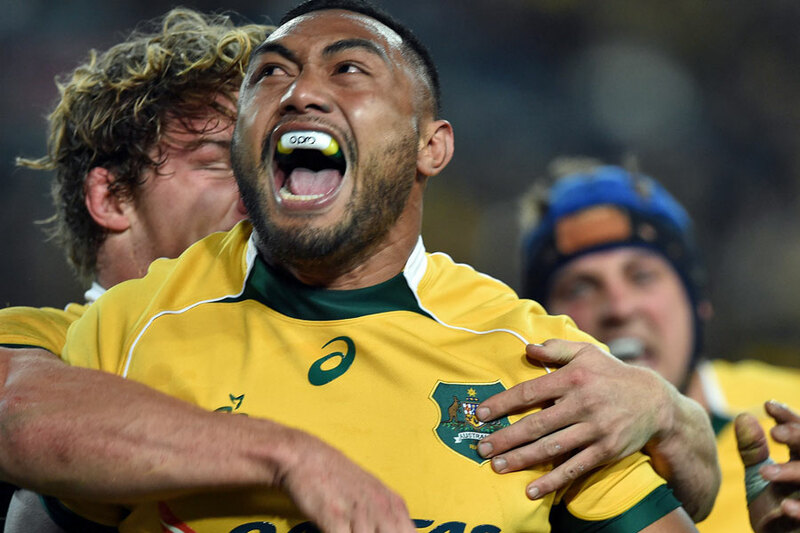 Australia have defeated New Zealand for the first time since 2011, claiming victory in a see-sawing Bledisloe Cup Test at ANZ Stadium to win the Rugby Championship. The Wallabies claimed victory off the back of a strong scrummage, and great returns from Matt Toomua and Nic White off the bench after Sekope Kepu had scored his first Test try shortly after half-time to put Australia ahead for the first time in the game. Michael Cheika's decision to start twin openside flankers Michael Hooper and David Pocock alongside each other in the back-row reaped massive rewards at the breakdown from the opening whistle, while Scott Fardy was also immense in the No.6 jumper. White was the unlikely hero, however, the replacement scrum-half turning the game on its head after he had replaced the disappointing Nick Phipps to kick a pivotal 48-metre penalty goal and then run in the match-securing try. White broke the All Blacks' line with eight minutes remaining when he sold a big dummy, much to the delight of the crowd of 73,824, converting his try to seal the win. 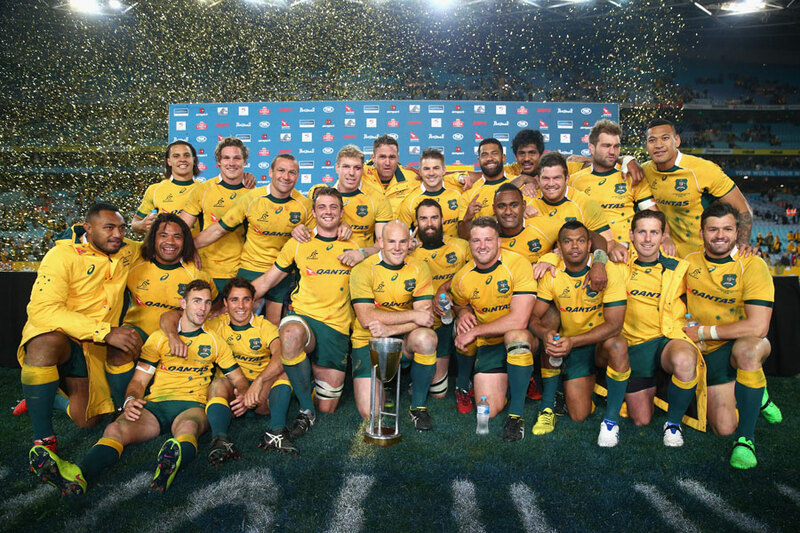 "We fought hard for each other, and the crowd really lifted us there at the end," Wallabies captain Stephen Moore said. "Both sides pushed the boundaries and it was a good contest." Moore also paid tribute to his team''s defence, saying 'we hung in there". "We worked hard, covered for each other. I was really proud of that effort." 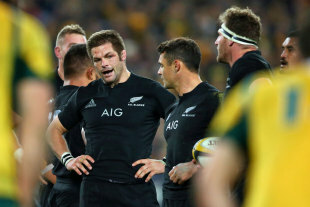 Richie McCaw, who equalled Brian O'Driscoll as the most-capped Test player in history with his 141st international appearance, paid credit to the Wallabies in saying simply that "they took their opportunities". "It was a pretty intense sort of match," the All Blacks captain said. "It probably came down to a couple of missed tackles that counted at the end. I thought when we got back in the game, when we got ahead with 15 to go that's when we need ed to be really sharp, not playing at the wrong end of the field, and a couple of lapses on defence was the difference in the end." "We made it a little bit easy through some poor decision making and they took their chances ... we've won games in the past because we got that right, but tonight we didn't and the Wallabies did.". The All Blacks led 6-3 at half-time after a scrappy and error-riddled stanza, but Australia made a blazing start to the second half when Kepu barged over to score the opening try of the game minutes after Aaron Smith had been given a yellow card for a high tackle on Adam Ashley-Cooper. Phipps was then yellow-carded for interfereing with a quick tap penalty twice from an offside position, and the All Blacks made the hosts pay. Test debutant Nehe Milner-Skudder crashed over after a terrific offload from Dan Carter found Ben Smith, who popped a pass to his flying right winger to make it 14-10 in favour of New Zealand. Toomua produced a big play shortly after replacing Bernard Foley, the playmaker producing a deft short kick behind the defence that sat up for Ashley-Cooper to crash through Ben Smith. 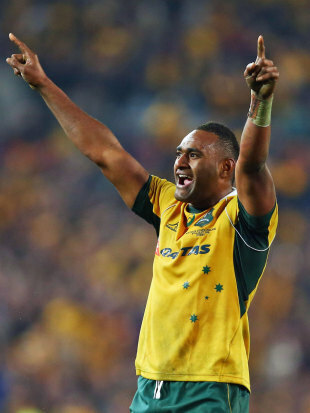 Matt Giteau slotted the conversion from the sideline, and the Wallabies led 17-14 with Phipps still in the sin-bin. The All Blacks hit back with Milner-Skudder scoring his second try on the right edge, taking three Wallabies over the line before coming up with a strong second effort to force the ball and make it 19-17. But the Wallabies would not be denied. The Wallabies now head to Auckland, hoping to secure their first Test win against the All Blacks at Eden Park since 1986 in order to regain the Bledisloe Cup for the first time since 2002. "We won't rest on our laurels," Moore said. "We'll work hard in the week. We've got another test in a week." Cheika said that he and his players had to remind "humble" after winning his first Test in charge against the All Blacks. "They put a bit of heat on us early, and maybe we lacked a bit of belief in the first half," he said, echoing comments he had made in an exclusive interview with ESPN. "We made some pretty silly choices." "We didn't do anything particularly special. We just stayed in it tonight and that's what we need to do. Keep showing that commitment and keep working hard and refining it as we go along." The coach was full of praise for his back-up halfback, saying "Nic White was given more time tonight based off the way he's performed in his training during the week and he wanted to take that opportunity". "He was asked if he wanted to kick a goal from long range ... he had good distribution and good service and he scored a try. That's what I want, I want blokes putting their hand up and saying `I want to be in this'." Cheika said of the huge challenge that will face the Wallabies in Auckland: "They're not going to be happy and it'll only get more physical ... in the lion's den away from home." All Blacks coach Steve Hansen said the Wallabies "played particularly well tonight and I think they thoroughly deserved the win and the championship". "They outmuscled us I thought at scrum time, they won the battle over the ball and under the body at breakdown," Hansen said.